Happy 50th birthday, Joanna! Today I lunched in Beverly Hills! We had a birthday celebration at the Ivy Restaurant. Mom, Vicky, Vannie, Patti, Joanna and Nia were all there. I had the chopped salad with turkey and without the egg. It was delicious and quite filling. I also had a delicious glass of Sauvignon Blanc. One forkful of the chocolate cake for luck and I was full. I wish I had a picture of the salad, but I don't. For dinner I was still full. I skipped dinner all together. Tonight I really didn't plan dinner. Tony was very tired when he came home from work and just wanted to eat a sandwich. 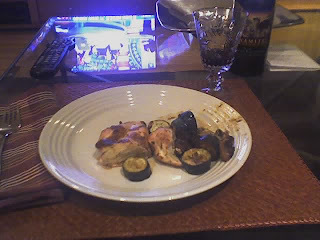 I cut up zuchini and mushrooms and baked them with a skinless chicken breast. I put a little non calorie seasoning on top and it came out okay. Tonight I definitely ate to live not lived to eat. At least I had a glass of wine. By the way the election results are in the background on TV. Yesterday was such a huge eating day, I am ready to go back to counting my points. After work, I went to Gelson's and bought plenty of fresh vegetables and fruit to keep myself on track. 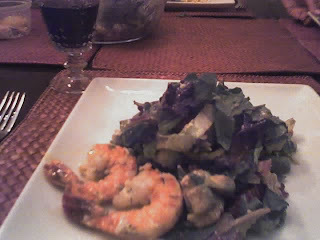 I also made myself a salad from the salad bar and added 4 marinated shrimp from the deli to round out my dinner. I rushed home to attend my online book club with Oprah when the phone rang. Michele Hovey called and was in need of a friend. I took the opportunity to ditch my first book club meeting and invited her over. We had a really nice evening and I shared my shrimp and salad with her. The way I figure, I ended up eating only 1/2 the points I probably would have and enjoyed myself also. 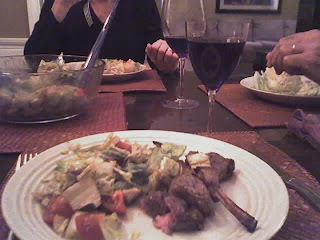 Tonight Jackie came over and we shared some salad and a couple of lamb chops. Breakfast this morning was quite good. Tony, Ted and I went to the coffee shop at Balboa golf course. (Tony's favorite breakfast spot) I had 6 points of food and it was quite good. I ate two poached eggs, 1 slice of wheat toast , and a beautiful cup of fresh fruit. Later today we are going to my cousin John's house for appetizers and then off to a restaurant for dinner. I will try to post pictures and a description later. Tonight we went to John and Pam Peterson's in Newport Beach. We had drinks and cheese and crackers at their house first, then we went to Mastro's Ocean Club for dinner. Needless to say, it was an eating extravaganza and I failed to count points today. Tomorrow is a new day. Well, I am still trying to learn this blogging thing. 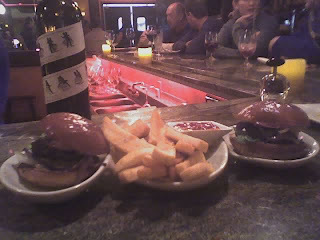 Last night I went to Vino, a Tapas bar with Tony and Ted. We sat at the bar and chatted with Stuart, the bartender from England. It was my first time there and it was really a nice place. We started with a ceaser's salad and fried calamari. I have to admit, I went with good intentions planning only to eat scallops and salad, however the plates were all small and so beautifully prepared I tried a bit of everything.